Gamers always seem to want more. Single player isn't enough. Multiplayer isn't enough. Even co-op gameplay isn't enough. What gamers want now is crossplayer, and with the current pace of change on the videogame industry, they will have it sooner than later. Crossplayer is the complete fusion of a single player game and a multiplayer game. Deathmatch and deep story might seem like completely opposite elements, and they are, because they evolved and grew separately from one another. If you're going to enjoy multiplayer, you have to be experienced enough to not get killed over and over again. And if you're going to enjoy a story, you have to like being alone. Or so the conventional wisdom goes. Multiplayer offers players the ingenuity and unpredictability of interacting with real people, as well as the emotional high that comes from competition and teamwork. Single player offers the possibility for a deep, rich, and meaningful experience, as well as scripted moments and set-pieces. Fusing the two lets you take all the best parts of both, and keep different audiences satisfied. "There used to be this belief that only 5% of people that bought a game actually went online to play with other people," says Paul Wedgwood, founder of Splash Damage, a developer that firmly believes social interaction is the future of interactive entertainment. "We know that people have better videogame experiences when they play with other people," he emphasizes, adding: "At present, I would say that the large majority of people have the best experiences when they're playing cooperatively rather than playing competitively." Wedgwood explains if you fail in a cooperative match, you fail against videogame AI - and you fail together with your co-players. The experience of failure is shared, as is the experience of possible victory. But if you fail in multiplayer, you've lost the game, while someone else has won. "In a competitive match, half the players fail every single time," he says. It's compelling logic, and it underlines that cooperative play is more about players sharing a story. 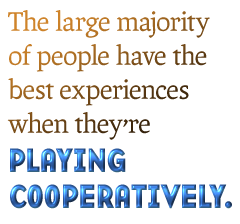 Wedgwood thinks that most games benefit from allowing players to play together, and that having a cooperative mode is probably one of the most important factors in a game's ability to create fun. Gamers have downloaded Splash Damage's free multiplayer shooter Wolfenstein: Enemy Territory, for example, 15 million times and played more than 500 million competitive matches so far. "There's definitely this sense that the amount of people playing online can have a significant impact on the success of the title," says Wedgwood, who also suggests publishers can use that base to fuel the creation of downloadable content. Splash Damage's next game, Brink, blurs the lines between a single-player, story-driven campaign and an online multiplayer shmup. As you play through, it's impossible to tell if you're fully-online, fully-offline, or a blend of the two.